In 2007, I entered the G4 portable world. I loved my Lombard PowerBook G3, but the call for a G4 got too much, and I picked up a bargain 400 MHz Titanium PowerBook G4. Introduced on January 9, 2001, these were super-thin machines just an inch thick when closed. 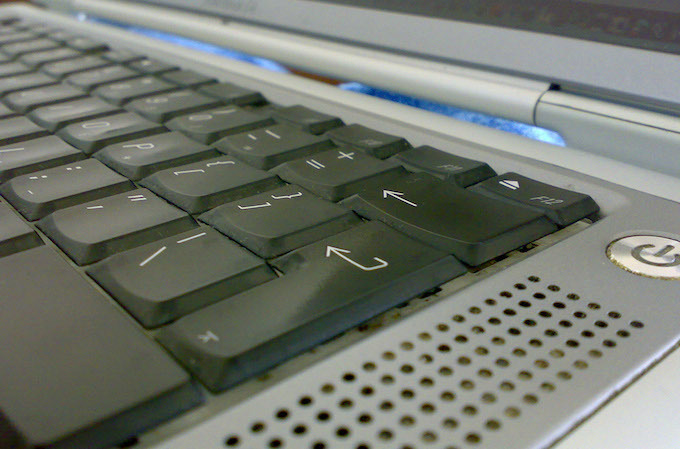 The Pismo PowerBook G3 was replaced by the PowerBook G4, and there were some major changes. The PowerBook G4 was slimmer and lighter, had a G4 processor, a built-in slot-loading DVD drive, no swappable media bays, and a lovely 15″ widescreen 1152 x 768 display. It had the same 100 MHz system bus and same 8 MB ATI Rage Mobility 128 graphics card as Pismo, but it dropped to only one FireWire port. From the minute I got it out of its packaging, I marveled at its design. Even six years after its initial release, it was still amazingly designed, and I had seen nothing in the Windows world to rival it. It’s metal finish felt cold in my hands and did so every morning when I started it up. Of course, being a first generation product threw up some problems that were to be rectified in later revisions. The first problem was heat. The bottom of the laptop used to get so hot it would warm your legs even through jeans. The second problem was the screen housing. The lid/screen was so thin that the heat from the machine could warp it over time, and if this was too much, it would affect the lid latch’s ability to keep the lid shut. The third problem was that the white paint on the rim around the edge was prone to flaking, and over time the rim could also split. The same design was used four variations with huge changes, such as increasing processor speed from 400 and 500 MHz in the first generation to 867 MHz and 1 GHz in the last, increasing graphics from 8 MB ATI Rage Mobility 128 to 64 MB ATI Mobility Radeon 9000, increasing resolution from 1152 x 768 to 1280 x 854, and switching from VGA to DVI video output, as well as the usual faster memory bus and larger, better hard drives. And where the first generation had DVD-ROM drives, the final top-end 1 GHz model had a CD-RW/DVD-RW SuperDrive. The Titanium PowerBook G4 was a great machine. I had several models (a few 400 MHz, a 500 MHz, and an 867 MHz) and loved them all. The design was great, and despite its mentioned flaws, they were an improvement over the Pismo. The Pismo is often regarded as the king of the PowerBook G3 range, and anything after that had to live up to a lot. It made a good impression and was a design masterpiece – and a brilliant work horse too.